Well-known to audiophiles, French loudspeaker manufacturer Focal has built a reputation by making some excellent loudspeakers over the years. What sets Focal apart from today's typical loudspeaker manufacturer is that in addition to designing and manufacturing all their loudspeaker models in France, they also build their own cabinets and every single component that goes into those enclosures, including drivers. Having 100 percent in-house engineering and manufacturing capability enables Focal to control every aspect of design and production. It also means that crossovers can be simpler designs because the proprietary drivers are purpose built for the exact dimensions and shape of the speaker cabinet. Several Focal loudspeakers have been reviewed here at HomeTheaterReview.com, including all the Sopra models and the recently introduced Kanta No. 2. However, starting at just shy of $10,000 and up, those speakers are only within reach of the well-heeled audiophile. What about the those of us who aren't one-percenters? 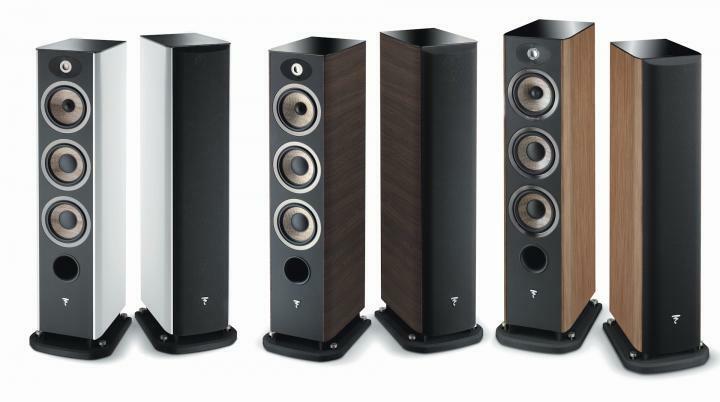 The Focal Aria 926 ($3,299 per pair) is the smallest floorstanding loudspeaker in the Aria line, which fits between the Chorus and Kanta lines of Focal's extensive range of loudspeakers. The Aria family is comprised of three floorstander models, one bookshelf model, one center channel, and a wall-mounted surround sound speaker. Focal says the Aria 926 is ideal for rooms measuring from 215 square feet with a listening position of 10 feet from the loudspeaker. My reference listening room is very close to that size, so it seemed like the optimal choice going into this review. The three-way Aria 926 loudspeaker has a leather-wrapped front baffle framing two 6.5-inch flax cone bass drivers in parallel, one 6.5-inch flax cone midrange driver, and a one-inch TNF aluminum magnesium alloy inverted dome tweeter with waveguide. The tweeter borrows design elements from the beryllium tweeters found in Focal's Sopra and Utopia lines, but at a much more affordable price. The speaker is a dual ported design with a front port for more bass impact and a bottom port for additional bass depth. Flax is a plant that's been cultivated for centuries for its seed (linseed) and for the textile fiber (linen) made from its stalks. France happens to be the main cultivator of fiber flax in Europe. Historically, Focal has used a variety of materials in a sandwich configuration for their diaphragms. The company believes that a combination of materials is better able to achieve the three essential criteria they consider necessary to realize the utmost fidelity from a diaphragm than any single material on its own. Those three criteria are low mass, a highly rigid structure, and very good damping for uncolored sound. For the Aria line, Focal looked for a material that could be machined rather than the labor-intensive hand-weaving process required for their "W" sandwich diaphragms found in the more expensive Sopra and Utopia lines. Focal patented what they call the "F" sandwich, which has a thin layer of glass fiber on both sides of a core of flax. This three-layer combination of materials is much more affordable to produce. Focal claims that the "F" sandwich diaphragms achieve the best combination of results for the three criteria at its given price point. For more details, you can read Focal's white paper on the subject here. The Aria 926 loudspeakers arrived in single-layer cardboard boxes, but the cabinets were wrapped in a foam bag with plenty of molded foam inserts surrounding them for protection from shipping damage. The method did its job because the speakers were flawless upon unpacking. Knowing the Aria 926 is the smallest of three floorstander models in the line, might lead you to believe that it's a bit smaller than it actually is. The speaker measures 40-3/4 inches tall by 11-9/16 inches wide by 14-5/8 inches deep and weighs in at 55 pounds. The speaker comes with a cast black aluminum alloy base with adjustable spikes that provides the necessary clearance for the bottom port after mounting per the provided instructions and wrench. The nonparallel cabinet sides are angled in slightly front to back while the cabinet front has rounded vertical edges, enhancing the speaker's appearance. The speaker is finished with a black glass top, adding a further touch of design sophistication and blending nicely with the black high gloss cabinet finish of the review samples. The fit and finish are impressive for a speaker at this price point. Other cabinet finishes available include prime walnut, an oak colored finish, as well as the recently discontinued (hence discounted at retail) noyer. The flax drivers are quite attractive, but can be easily hidden by attaching the included full-length magnetic black grill if desired. Like most Focal speakers, I found just a single set of robust binding posts around back. Focal doesn't typically provide multiple sets of binding posts for a bi-amping option given their easy load and higher-than-average sensitivity specs. The Aria 926 is no different in that regard, with 8 ohms nominal impedance of and rated sensitivity of 91.5 dB. That doesn't mean they won't still benefit from a high-quality power amplifier, though. Before moving the Focals to my dedicated listening room, I first connected them to my family room system for a couple of weeks to break them in while serving television audio duty. Next, the Focal Aria 926s were moved upstairs, taking the place of the just-reviewed Sonus faber Sonetto IIIs in my listening room. I connected them to the usual reference electronics including a Classé CA-5300 amp and Classé CP-800 Preamp for two-channel, as well as a Marantz AV8801 Preamp for multichannel audio. Sources included an Oppo BDP-205 4K Ultra HD Blu-ray disc player, and a Mac Mini as music server streaming from music services Tidal and Qobuz. All connections were made with WireWorld cables and interconnects. After some experimentation, the Focal Aria 926s ended up in almost the same location as the Sonettos--about five feet from the front wall, eight feet apart, and toed in slightly.